Acclaimed worship band Hillsong United says they're "honored" to be nominated for an American Music Award for the second year in a row. 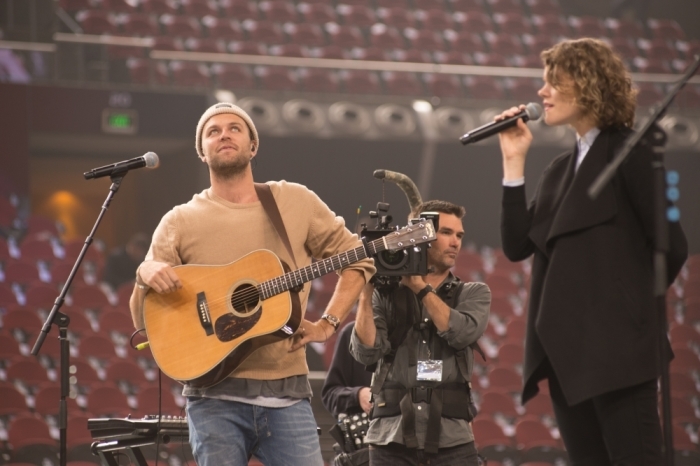 The "Touch the Sky" artists, led by megachurch Pastor Joel Houston, scored an AMA nod in the "Favorite Artist – Contemporary Inspirational" category ahead of next month's awards show at the Nokia Theater in Los Angeles. The recognition comes five months after the release of Hillsong United's fourth studio album Empires, which debuted at No. 1 on Billboard's Christian albums chart. "Honored and excited to be nominated for the American Music Awards,'" the Australian band wrote via Facebook last week. Earlier this year the band won a Billboard music award for Top Christian Artist. During an interview with The Christian Post last October, Houston attributed the band's numerous accolades, which includes winning multiple Dove Awards and producing three No. 1 studio albums, to the story of God's grace. "... It continues to blow our minds, but what I love about our guys is there's this super unassuming quality to our team when it comes to that stuff," said Houston. "It's like, hey, we won five Dove awards, and that's fine but there was no fanfare, no party. It wasn't like we were high-fiving or jumping around excited about it. I think for us it just continues to add to this story of God's grace and that He'd choose to use people like us. It applies to everything that we do as a church." The Sydney, Australia-based pastor will join his bandmates in New Jersey this week for Hillsong megachurch's annual conference, where they are expected to perform. "I'm not trying to write songs that are cool or hip or that keep up to date with whatever is out there on the radio," he said. "We're genuinely just trying to write songs that are honest reflections of a creative God and music that helps people connect with God." The band was formed in 1998 as a pastime for youth at church and over the years it has grown into an internationally recognized worship band. Hillsong has churches around the world with more than 100,000 weekly attendees, including thriving congregations in New York and Los Angeles. An estimated 50 million people sing their songs every Sunday. The American Music Awards will broadcast live on Sunday, Nov. 22 on ABC.